nience, he went to Lucca, where he was made superior of St. Fridian, a house of his own order; and there he lived with Tremellius and Zanchius, whom he is said to have converted. 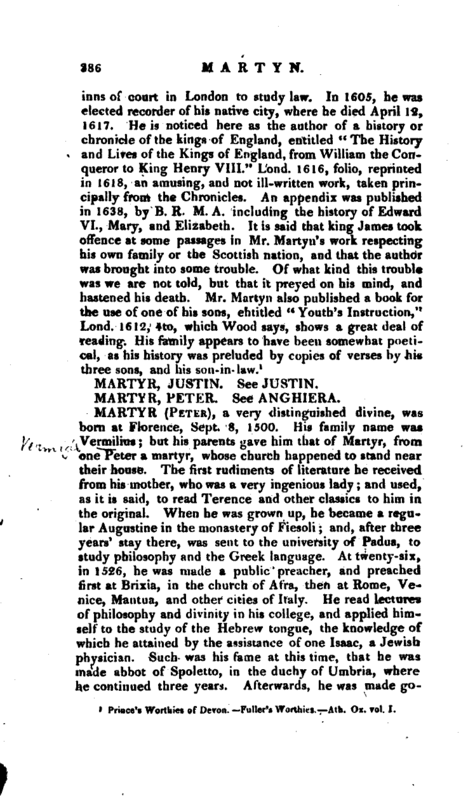 But, finding himself in more danger here, he left the city secretly, and travelled to Pisa; whence, by letters to cardinal Pole, and to the society of Lucca, he fully explained the reasons of his departure. 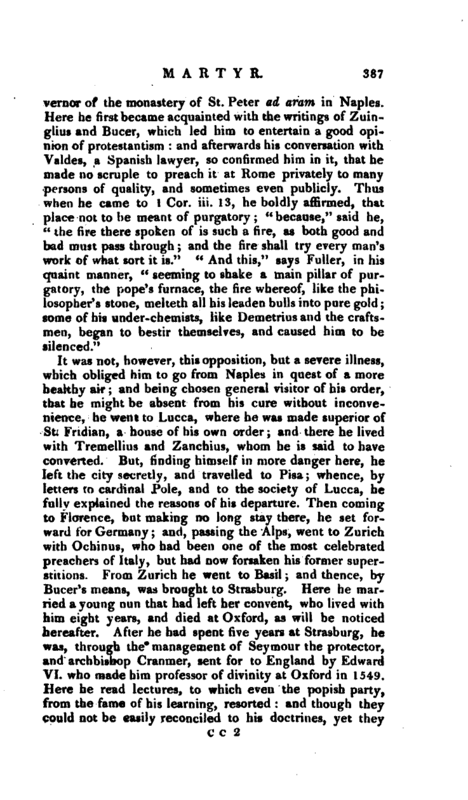 Then coming to Florence, but making no long stay there, he set forward for Germany; and, passing the Alps, went to Zurich with Ochinus, who had been one of the most celebrated preachers of Italy, but had now forsaken his former superstitions. From Zurich he went to Basil; and thence, by Bucer’s means, was brought to Strasburg; Here he married a young nun that had left her convent, who lived with him eight years, and died at Oxford, as will be noticed hereafter. After he had spent five years at Strasburg, he was, through the management of Seymour the protector, and archbishop Cranmer, sent for to England by Edward VI. 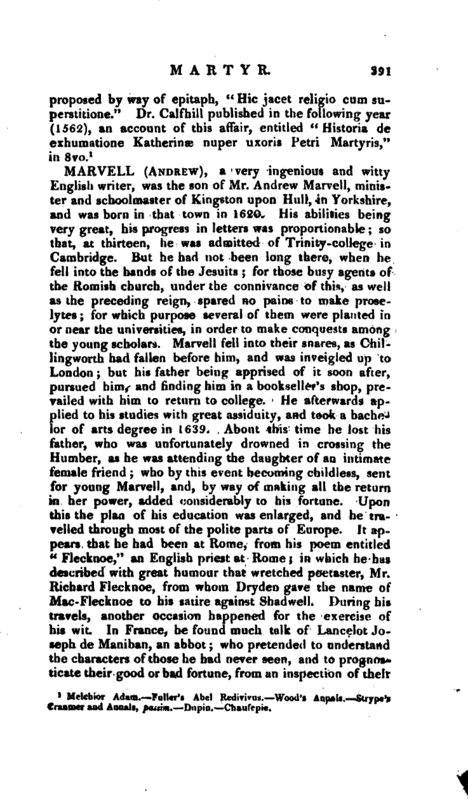 who made him professor of divinity at Oxford in 1549. Here he read lectures, to which even the popish party, from the fame of his learning, resorted: and though they could not be easily reconciled to his doctrines, yet they | bore him with some patience, till he came to handle that of the Lord’s Supper. 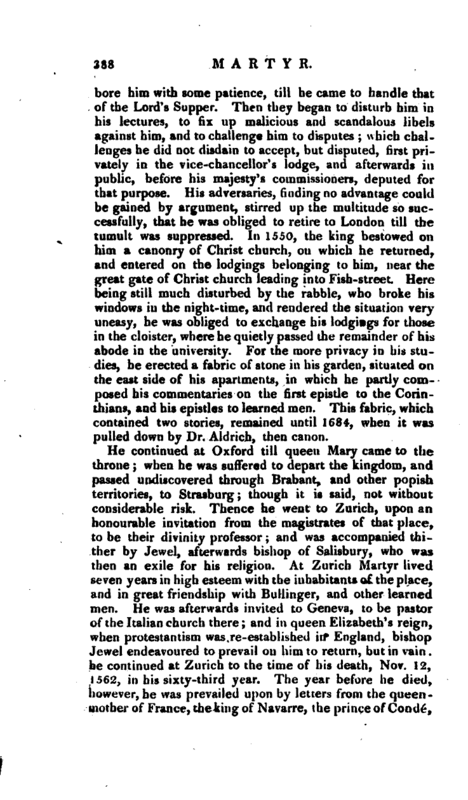 Then they began to disturb him in his lectures, to fix up malicious and scandalous libels against him, and to challenge him to disputes; uhich challenges he did not disdain to accept, but disputed, first privately in the vice-chancellor’s lodge, and afterwards in public, before his majesty’s commissioners, deputed for that purpose. His adversaries, finding no advantage could be gained by argument, stirred up the multitude so successfully, that he was obliged to retire to London till the tumult was suppressed. In 1550, the king bestowed on him a canonry of Christ church, on which he returned, and entered on the lodgings belonging to him, near the great gate of Christ church leading into Fish-street. Here being still much disturbed by the rabble, who broke his windows in the night-time, and rendered the situation very uneasy, he was obliged to exchange his lodgings for those in the cloister, where he quietly passed the remainder of his abode in the university. For the more privacy in his studies, he erected a fabric of stone in his garden, situated on the east side of his apartments, in which he partly composed his commentaries on the first epistle to the Corinthians, and his epistles to learned men. This fabric, which contained two stories, remained until 1684, when it was pulled down by Dr. Aldrich, then canon. He continued at Oxford till queen Mary came to the throne; when he was suffered to depart the kingdom, and passed undiscovered through Brabant, and other popish territories, to Strasburg; though it is said, not without considerable risk. Thence he went to Zurich, upon an honourable invitation from the magistrates of that place, to be their divinity professor; and was accompanied thither by Jewel, afterwards bishop of Salisbury, who was then an exile for his religion. 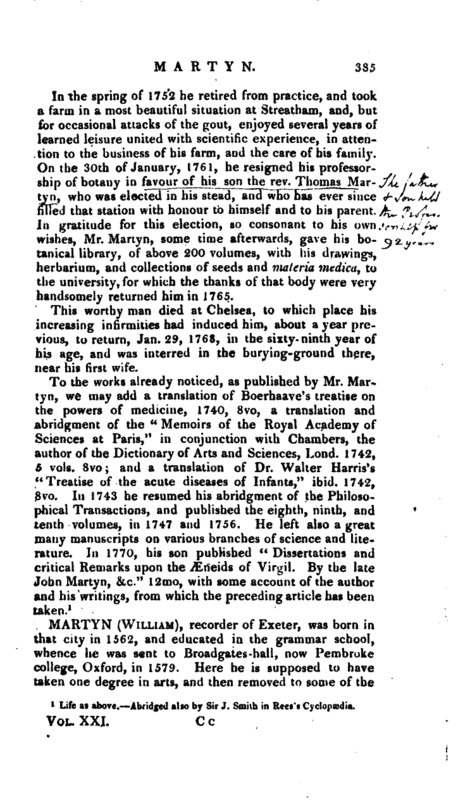 At Zurich Martyr lived seven years in high esteem with the inhabitants of the place, and in great friendship with Bullinger, and other learned men. He was afterwards invited to Geneva, to be pastor of the Italian church there; and in queen Elizabeth’s reign, when protestantism was re-established in England, bishop Jewel endeavoured to prevail on him to return, but in vain; he continued at Zurich to the time of his death, Nov. 12, 1562, in his sixty-third year. The year before he died, however, he was prevailed upon by letters from the queenmother of France, the king of Navarre, the prince of Conde", | and other peers of that realm, to go over into France to the solemn conference at Poissy, where he disputed against the papists, with Beza and others. Not long after his arrival at Zurich, he took a second wife, who was recommended to him from the Italian church at Geneva, where she lived an exile for religion. He had two children by her, who both died very young, and before him; and he left her with child of a third, which proved a daughter. 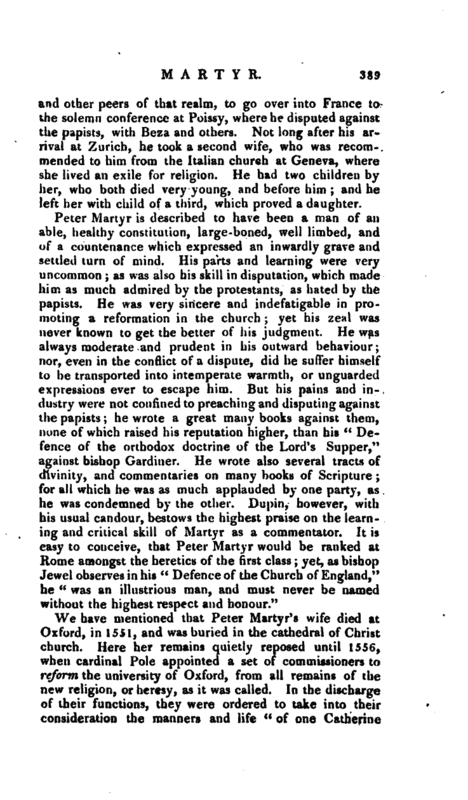 We have mentioned that Peter Martyr’s wife died at Oxford, in 1551, and was buried in the cathedral of Christ church. 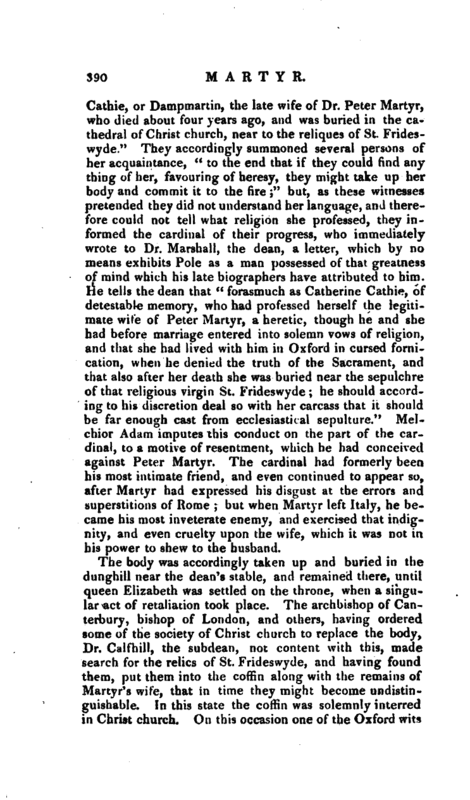 Here her remains quietly reposed until 1556, when cardinal Pole appointed a set of commissioners to reform the university of Oxford, from all remains of the new religion, or heresy, as it was called. In the discharge of their functions, they were ordered to take into their consideration the manners and life “of one Catherine | Cathie, or Dampmartin, the late wife of Dr. Peter Martyr, who died about four years ago, and was buried in the cathedral of Christ church, near to the reliques of St. Frideswyde.” They accordingly summoned several persons of her acquaintance, “to the end that if they could find any thing of her, favouring of heresy, they might take up her body and commit it to the fire” but, as these witnesses pretended they did not understand her language, and therefore could not tell what religion she professed, they informed the cardinal of their progress, who immediately wrote to Dr. Marshall, the dean, a letter, which by no means exhibits Pole as a man possessed of that greatness of mind which his late biographers have attributed to him. He tells the dean that “forasmuch as Catherine Cathie, of detestable memory, who had professed herself the legitimate wife of Peter Martyr, a heretic, though he and she had before marriage entered into solemn vows of religion, and that she had lived with him in Oxford in cursed fornication, when he denied the truth of the Sacrament, and that also after her death she was buried near the sepulchre of that religious virgin St. Frideswyde; he should according to his discretion deal so with her carcass that it should be far enough cast from ecclesiastical sepulture.” Melchior Adam imputes this conduct on the part of the cardinal, to a motive of resentment, which he had conceived against Peter Martyr. The cardinal had formerly been his most intimate friend, and even continued to appear so, after Martyr had expressed his disgust at the errors and superstitions of Rome; but when Martyr left Italy, he became his most inveterate enemy, and exercised that indignity, and even cruelty upon the wife, which it was not in his power to shew to the husband. 1 Melchior Adam. Fuller’s Abel Redivivus. Wood’s Annjjs. —Strypefs Cranmer and Annals, faaim, P;ipm. Chaufcpie.